If you love track days and also love spending time with the family, step over here my friend because we have the perfect car, or cars, for you. That is, assuming you can afford the extremely high price tag and maintenance costs associated with the Arrows AX3, a three-seat Formula One race car offered for sale through RaceCarsDirect.com. The listing is actually for a pair of cars as two examples of the AX-3. The cars were built by Arrows Grand Prix International, a British-based F1 team that operated for 24 years, in 2001. The Arrows alumni list is littered with some top-flight talent on both the management and driver’s side of the table. One notable name is Tom Walkinshaw, whose name still stands tall among Aussie race fans. 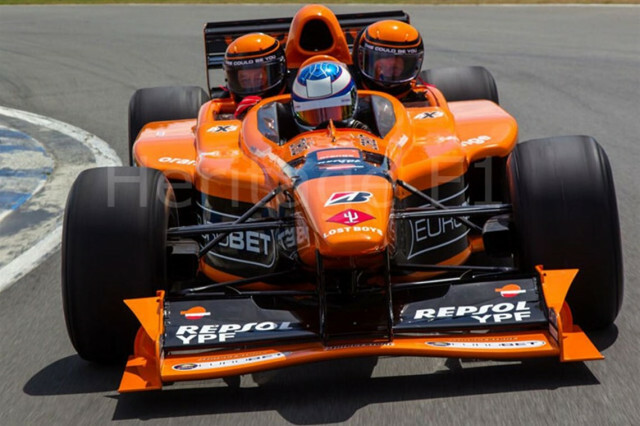 It was Walkinshaw who had his team build this pair of three-seaters to provide F1 fans with an unrivaled view of the on-track experience. Other fan rides exist, but they’re typically two-seaters with an inline setup. That means the passenger gets a view of the back of the driver’s head. Sure, passengers still experience the speed and G-forces, but they don’t see what the driver actually sees. The AX3 works around that issue with its McLaren F1-esque cockpit. The driver sits ahead of the passengers, and the riders sit offset from the driver so they can see the road ahead. The asking price is stiff at more than $695,000 each. But you get a heck of a lot for that price. Each car is powered by 3.5-liter Hart V-10 engine that produces 720 horsepower. The engines rev up to an astonishing 15,000 rpm redline, too. These cars have also been perfectly maintained and each engine has been driven just 112 miles or so after a professional rebuild. If that’s not enough, the buyer or buyers also get a spare engine, tools, and other spare parts. In addition, the cars come with a set of exhaust silencers that drop the noise down to 92 db, in case you’re running at a track that has noise requirements. So, how about one parent in each car and the kids along for the ride as you aim for track records everywhere you go? That’s quality family time.